I’ve got into these copy-heavy bits of work designed to promote myself as a freelance copywriter. They’re stylish, efficient, and a great way to present my views on copywriting in a way that isn’t a 140-character tweet or a blog post. The latest one covers that tricky issue of SEO. You can view it by clicking the thumbnail below. It’s designed to showcase copy, provoke opinion, and steal attention. But, while I love how SEO has expanded the market for copywriters online, this is also fairly reflective of what I really think. 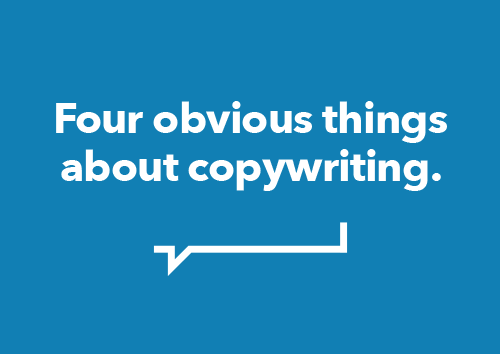 One of the hardest tasks as a freelance copywriter is working with the money side of things. It’s a shame, because for all of the job satisfaction and wonderful clients, it’s the money that matters. If you’re not getting paid, you may as well quit copywriting and write your world-changing novel or script! But negotiating a good deal with no experience is tough. Some extra advice can help you to organise your thoughts, set a price, and know how to get the copywriting fee you deserve, or the terms that suit you. Let’s talk about love. Do you love your girlfriend? Your husband? Your children? I recently saw a lorry delivering the regal bread Kingsmill. I noticed the big photo and pondered the idea that it might just contain one giant loaf of bread. But, more relevantly to a blog about being a freelance copywriter, I noticed the copy. And it got me thinking about my relationship with bread, and in turn the choice of words that we use when selling.